In loving memory of Al, Dad and Grandad who passed away with his family by his side on 29 March, 2019, after a long fought battle. An intelligent and charismatic man. We thank you for your love, your generosity and positive example of a life well-lived. 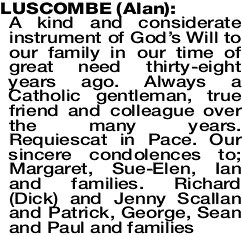 Love from your wife Margaret, Sue-Ellen, Kane, Iain, Jenny, Lisa, Brian, Jan, Mark, Peter, Belinda, Melissa, Michael and their families. 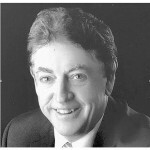 My beautiful Dad, my whole life you have loved me, guided me and made me the person I am today. I have been privileged to be your daughter. We have learnt much from the wonderful way you lived your life. Your lessons in optimism courage, strength wisdom, and happiness will remain with us always. Be at peace now. Love Sue-Ellen, Kane, Keely, Chelsea and Zac. 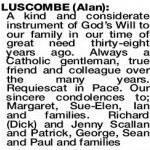 The Funeral Service for Mr Alan Luscombe of Trigg (formerly of Carine) will be celebrated in All Saints Catholic Church, Liwara Place and Orkney Road Greenwood, commencing at 10.15am on THURSDAY (4.04.2019). The cortege will leave the church at the conclusion of the Service and arrive at the main entrance of PINNAROO Valley Memorial Park, Whitfords Ave, Padbury, at 11.45am for a Burial Service. 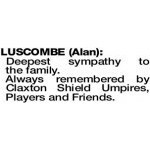 Always remembered by Claxton Shield Umpires, Players and Friends.